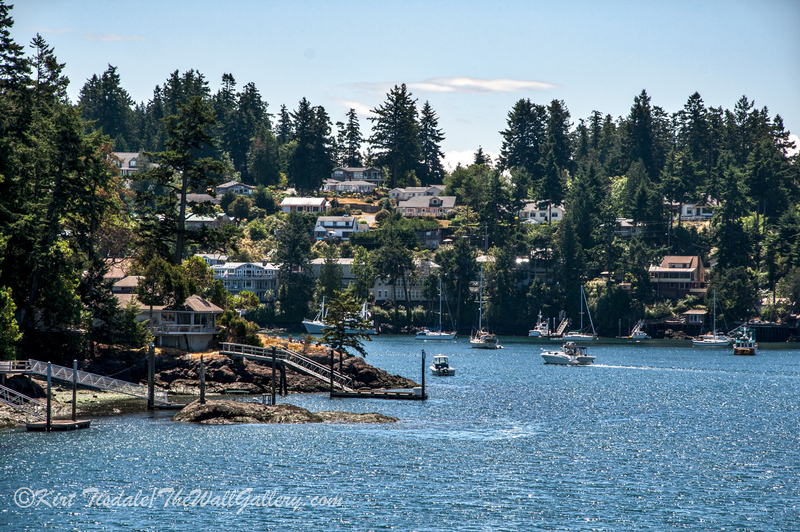 I wanted to continue from the last few weeks of sharing shots from our June weekend in the Seattle, Washington area (Ferry to Friday Harbor…Roche Harbor…Henry Island to Anacortes). 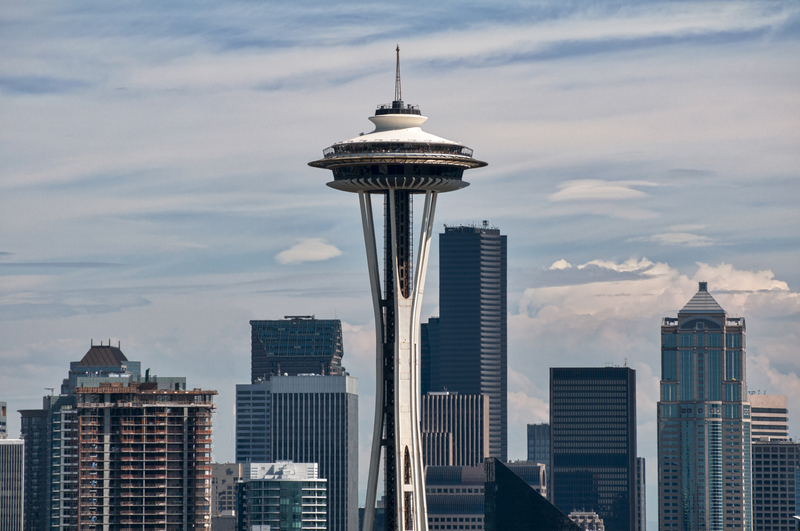 This week is my final installment and what would a photo shoot in the Seattle area be without the infamous Space Needle. 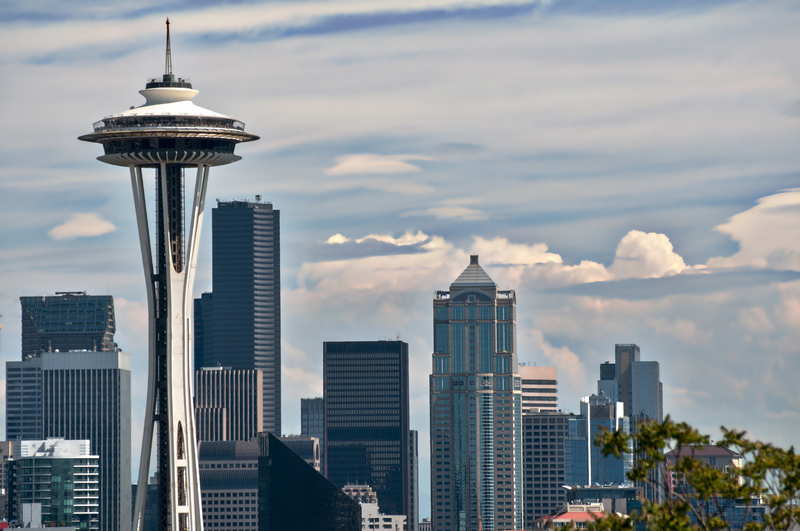 We stopped by Kerry Park, which is located in the Queen Anne District of Seattle. 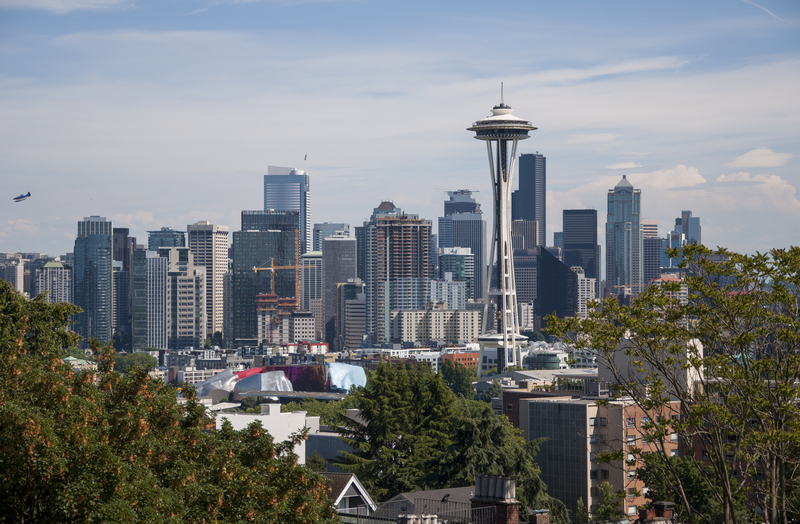 The park covers the southern slope of Queen Anne Hill and from the top elevation of the park; the sweeping views of Seattle are spectacular. This first capture gives you an overall feel for the view towards the Space Needle and downtown. I like the fact that on the far left side of the frame, you can see a seaplane on its final approach to landing in Lake Union. Lake Union is to the immediate left (east) of this location. We are looking south with Elliot Bay (Seattle waterfront) and the Puget Sound just out of the frame on the right. 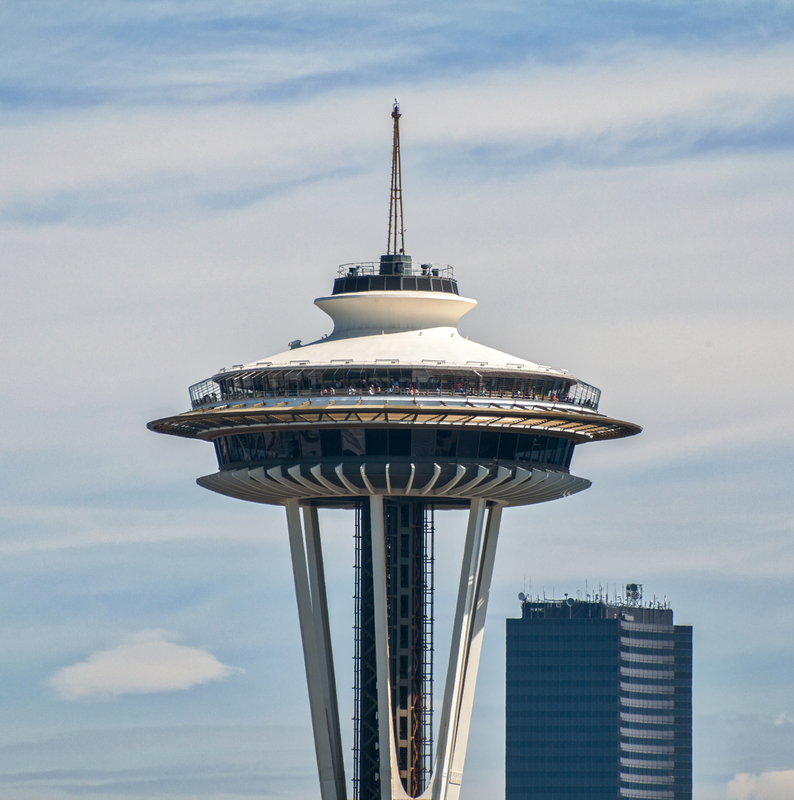 If you look at the base of the Space Needle, you can see some colorful buildings, which are located in the Seattle Center. The Seattle Center (where the Space Needle is located) was home to the 1962 Seattle Worlds Fair. The buildings today house a variety of venues, including theaters, museums, the Chihuly Garden and Glass Exhibit (I have seen four of his exhibits in different parts of the United Sates and this one is by far the largest), a park with an interactive fountain and many restaurants. And of course, who could forget the monorail connecting downtown with the Seattle Center. The second shot centers the Space Needle with the buildings of downtown filling in the background. 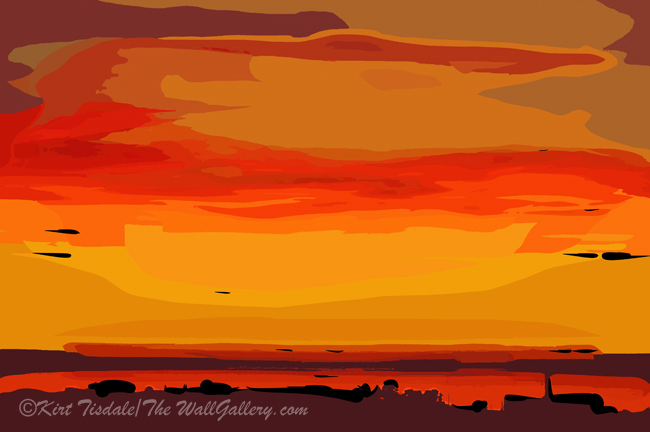 The third picture moves the Space Needle off center and allows some storm clouds to play a larger role in the composition of the frame. The fourth capture zooms in a little bit with the needle centered in the frame. Because of the elevation of the hill, you get more of a straight on shot with the angle slightly upward. The last shot is a full on zoom into the top of the needle. In this capture, you can clearly see the people on the observation deck. With this close up of the white roof, I wanted to make a note that during 2012, the 50th anniversary of the worlds fair, the roof was painted gold to commemorate the original color (I have a couple of shots from that year, but none of them up close and personal). I will only be adding a couple of these shots to my gallery; any favorites you would recommend? Thoughts? 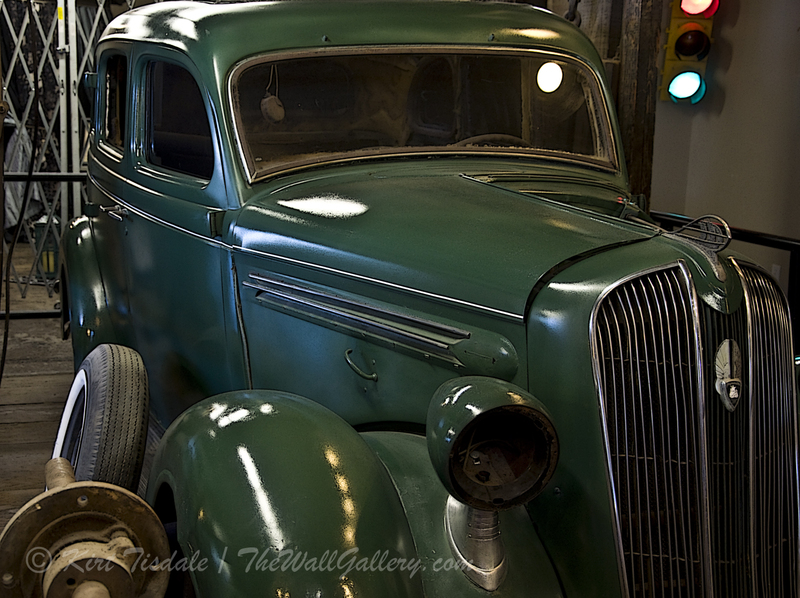 This entry was posted in Color Photography on July 31, 2015 by Kirt D Tisdale. The wall art prints I wanted to feature this week is a series I just added to my Architecture Gallery. 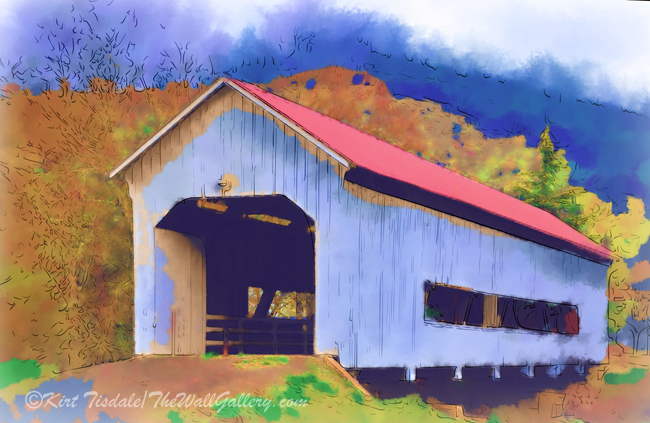 It’s of covered bridges in Oregon that I created using a soft watercolor technique. 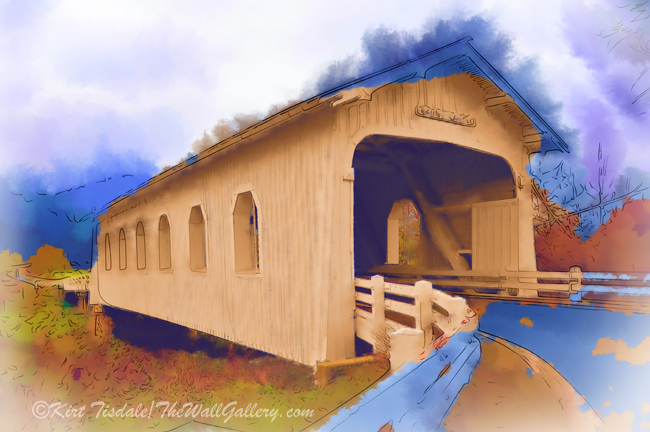 I have featured these bridges in prior posts, Sepia Prints, Covered Bridges Oregon Style and Covered Bridge Featured Art Print. They all stem from a March 2013 photo shoot of covered bridges in the south and central portions of Oregon. 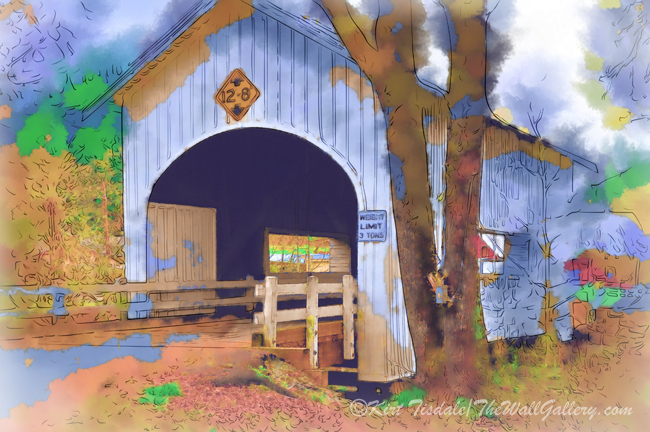 I love the look of covered bridges and the variety of ways in which they can be presented. 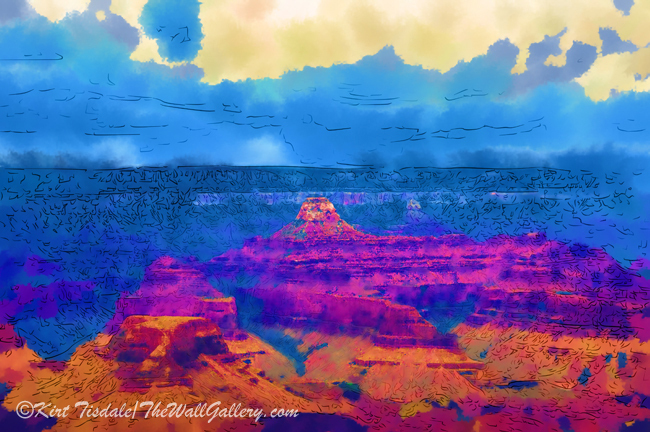 It took me until last month to create a soft watercolor look using the captures from the photo shoot as an inspiration. The first one is called Covered Bridge In Watercolor. 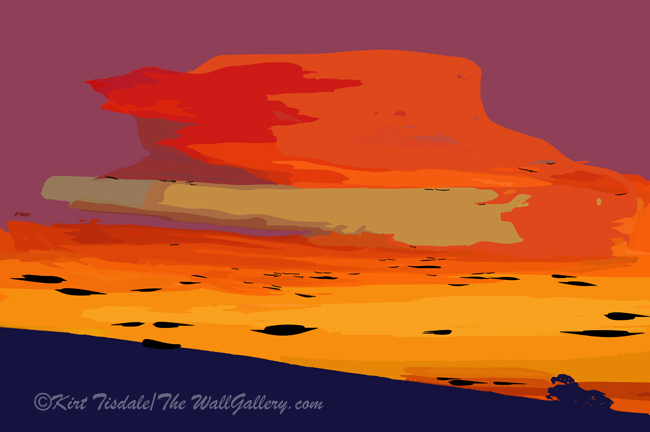 This is a rendition of the Neal Lane covered bridge. It is actually a very short covered bridge spanning a small creek. The second one I’ve titled Covered Bridge With Red Roof, for obvious reasons. This particular bridge isn’t used for vehicular traffic anymore, but sits as a reminder of days gone by. The third print is titled Stewart Bridge in Watercolor. This particular bridge also doesn’t carry vehicular traffic, but sits right next to a modern bridge that was built to carry highway traffic. The fourth print is called Grave Creek Covered Bridge In Watercolor. This bridge is still in use as part of a paved highway. I like the look of these prints using these historic landmarks. Thoughts? 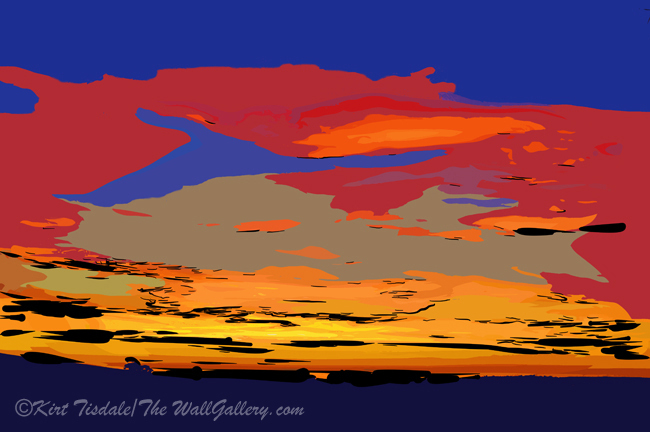 I invite you to visit my Architecture Gallery to enjoy these prints and many more. 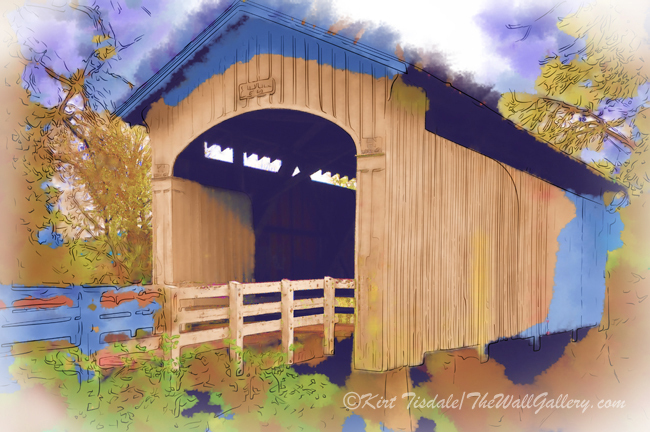 This entry was posted in Art Prints, Landscapes: Watercolor, Watercolor Painting and tagged art gallery, artist kirt tisdale, covered bridges, interior design, online art gallery, oregon, oregon covered bridges on July 27, 2015 by Kirt D Tisdale. 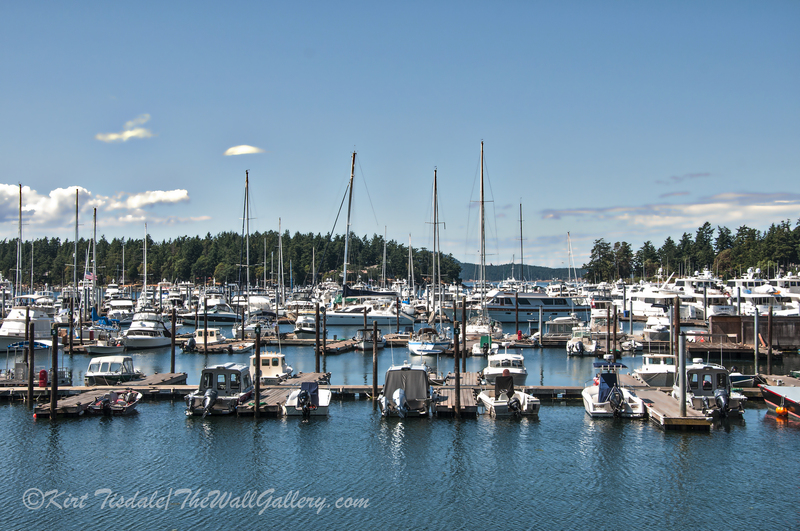 My post last week covered shots of Roche Harbor. 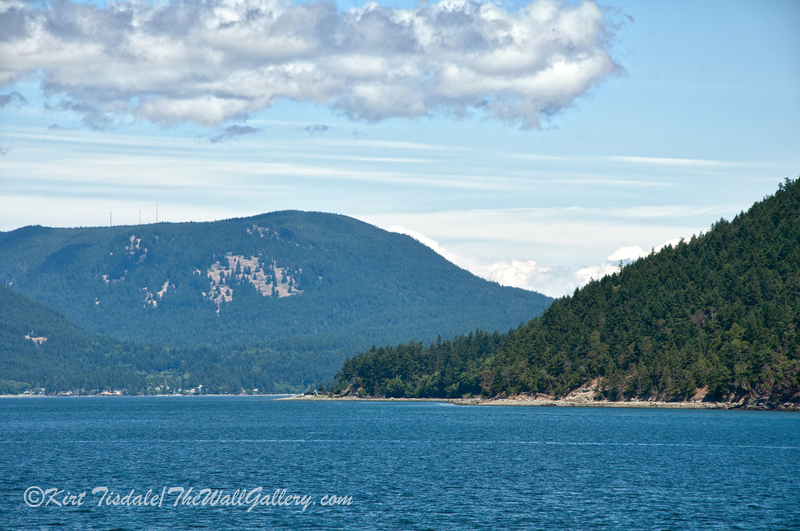 This week a couple of shots from Henry Island and then our return ferry ride back to Anacortes, Washington. Henry Island 1 gives you a good look from the shore of the property we were visiting across to a dock and Vancouver Island, British Columbia in the background. If you see a dot in the sky, it’s a seaplane circling around on its final approach into Roche Harbor. Also, notice how brown the grass is and remember this was taken in June, not August. The reduced amount of normal rainfall in the Pacific Northwest was very apparent with the grasses everywhere we went already brown this early in the season. 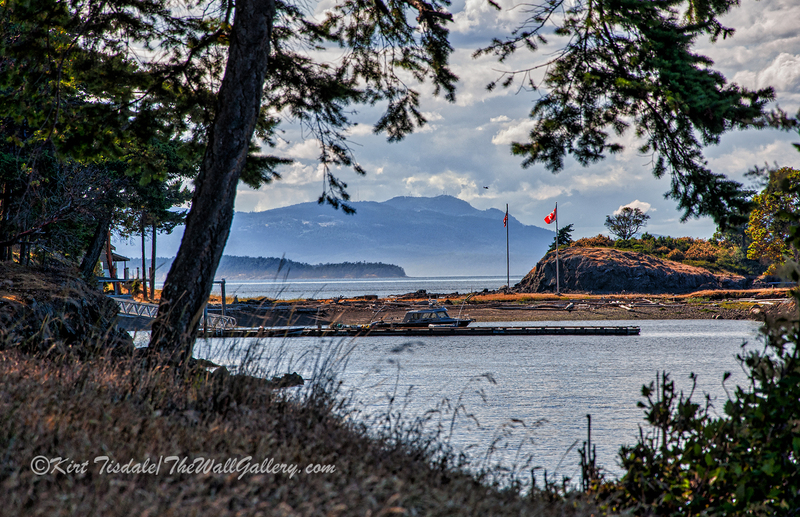 Henry Island 2 is a shot looking straight out towards a small island just off shore. 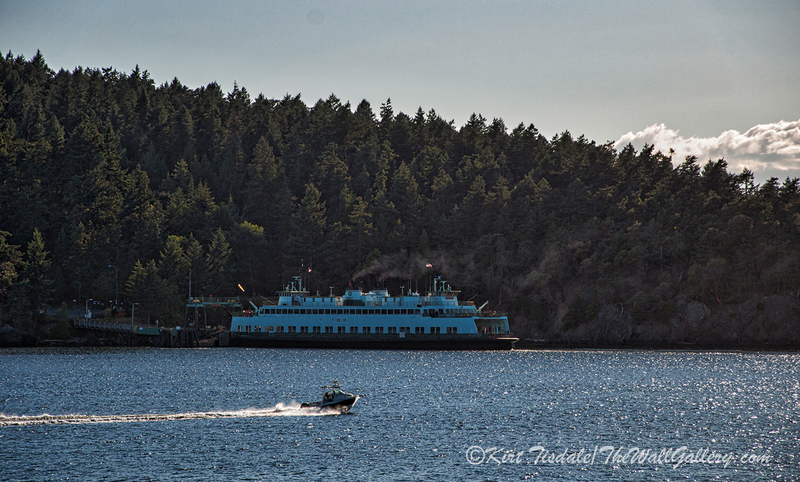 We had an incredible afternoon, but needed to get going to catch the 6:30 ferry from Friday Harbor back to Anacortes. So, we did the whole thing in reverse, took a small boat back to Roche Harbor, got our car and drove across San Juan Island to Friday Harbor and our ferry. The ferry ride back showed a different perspective than the ride to Friday Harbor. Henry Island 3 is a capture of Mt Baker on the mainland in Washington. 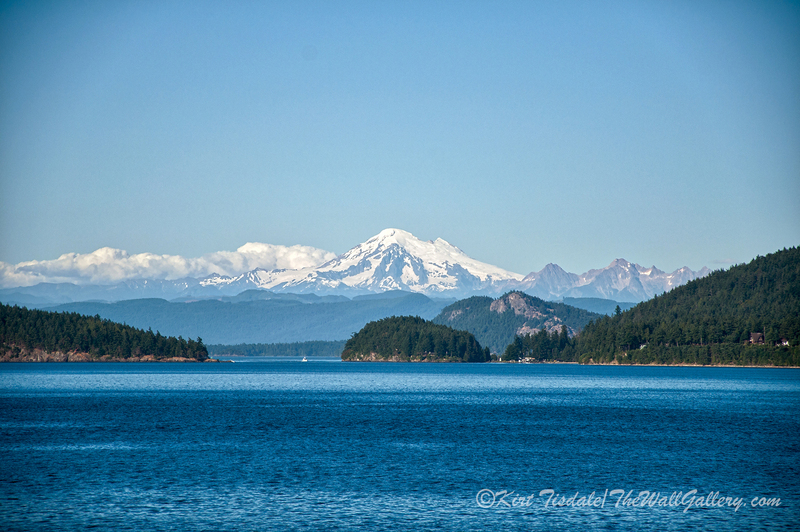 Mt Baker is one of the many volcanoes dotting the landscape from Mt Shasta in Northern California on up into Alaska. Henry Island 4 shows a sister ferry docked at one of the San Juan Islands along the way. This is a busy traffic route with multiple ferries connecting the different islands to the mainland in Washington and Vancouver Island in British Columbia. Henry Island 5 is a shot looking back towards the west as the sun was getting a little lower in the sky. This time of year, being this far north, the sunset is still many hours away. 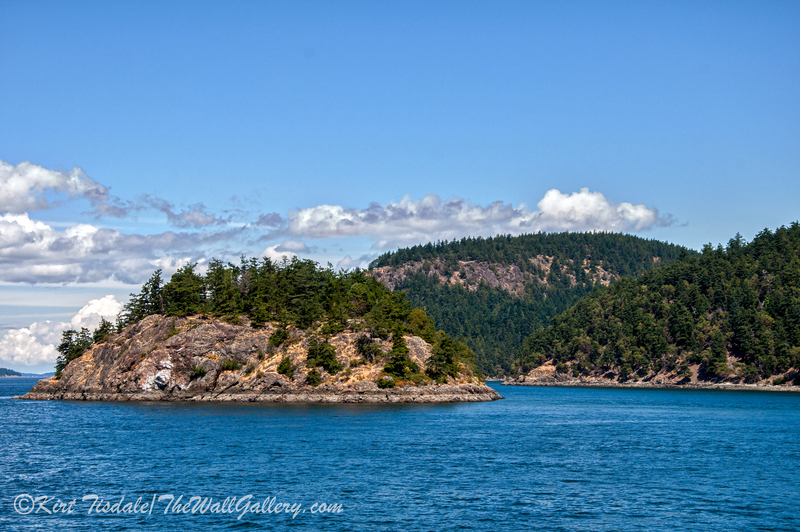 Henry Island 6 caught my attention as we approached Anacortes with the small rock outcroppings. It’s hard to see, but on that rock is a group of pelicans enjoying their summer evening. Henry Island 7 gives us another look at Mt Baker, which was behind one of the islands for most of the journey back. We were now coming into Anacortes and finishing the day adventure to Henry Island. Next week, I will share one final series. 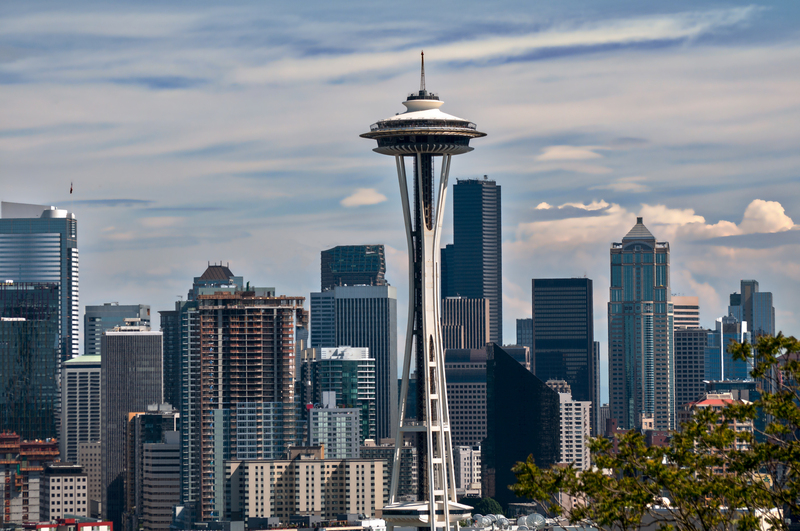 What would a trip to Seattle be without a photo shoot of the Space Needle and downtown? 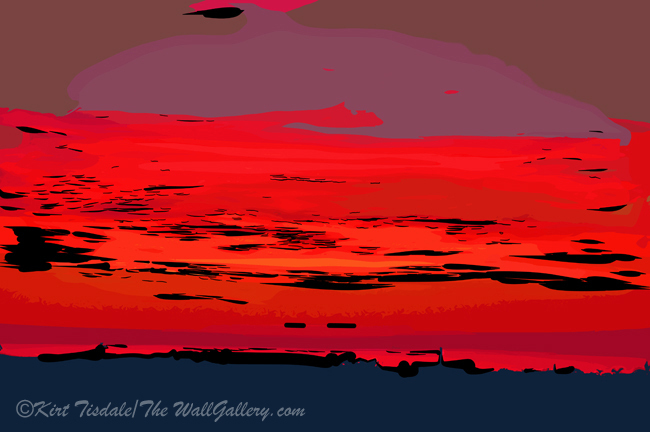 This entry was posted in Color Photography, Photography and tagged anacortes, henry island, kirt tisdale, mt baker, online art gallery, pacific northwest, photographer, roche harbor, seattle on July 21, 2015 by Kirt D Tisdale. 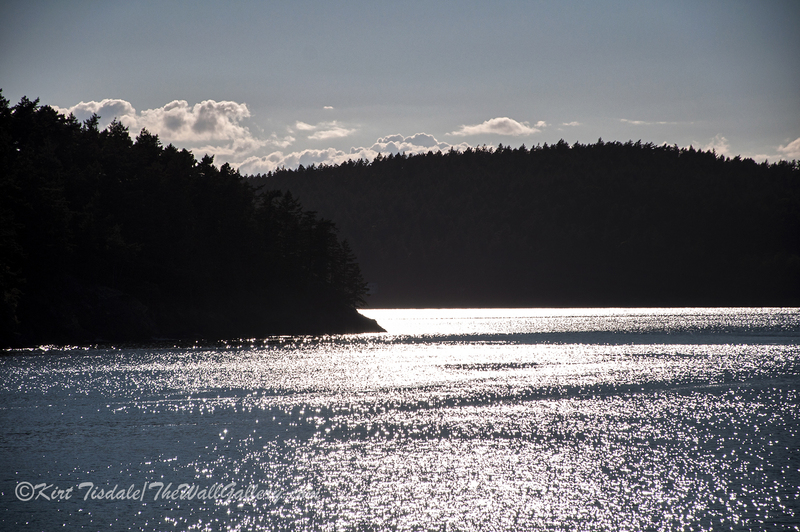 My post last week covered shots on the ferry ride from Anacortes on the mainland to Friday Harbor located on San Juan Island. 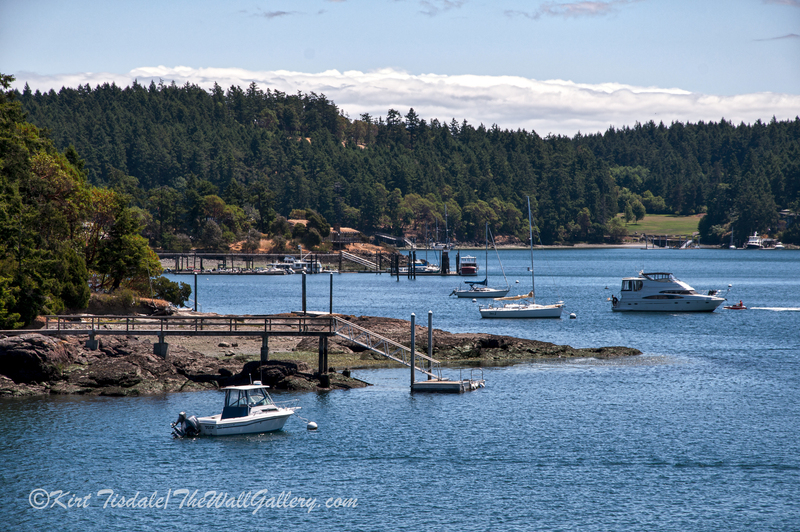 Today’s series will focus on Roche Harbor, where we caught a private boat over to Henry Island. 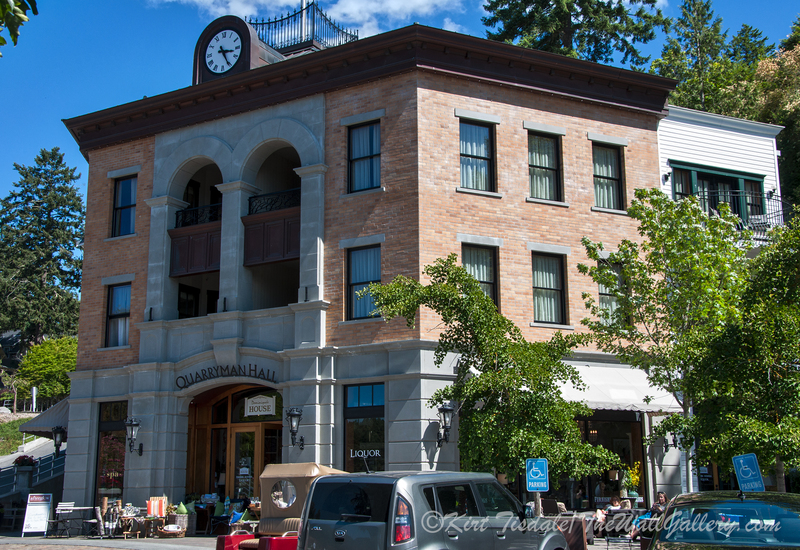 First, a little history of the Roche Harbor area. The area has a large hill of lime rock and a very pure form of lime was created from burning the rock. A rock quarry and kilns ensued and in 1886, a company town now known as Roche Harbor was built to support the workers of the quarry and kilns. Now, it is a resort that keeps true to the architecture of the era. Roche Harbor 1 gives you a good look at the marina and the sheer number of boats docked here. Roche Harbor 2 is a shot sweeping left from the first one. 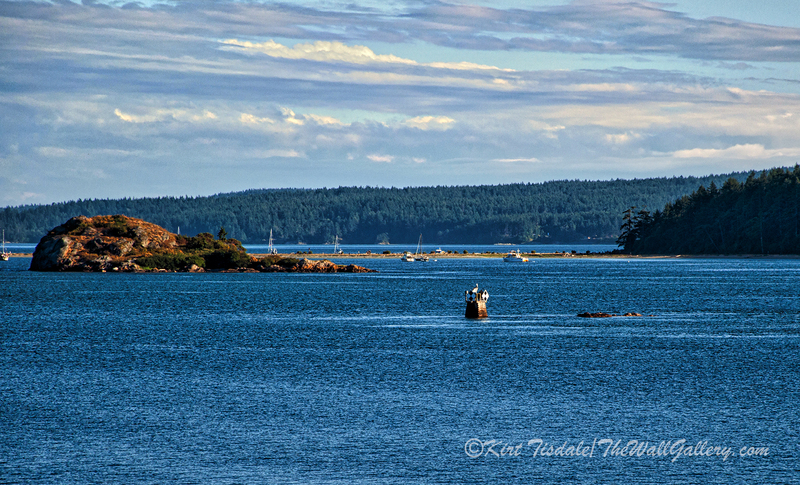 In this capture, you can see the entrance to the harbor and Henry Island (the forested land in the background). Roche Harbor 3 was taken from the same location as the first two shots, but this time sweeping right back towards the village itself. Roche Harbor 4 shows a “rustic” building called Quarryman Hall. This building is actually part of the resort and was built specifically to mirror the architecture in the era of the company town. 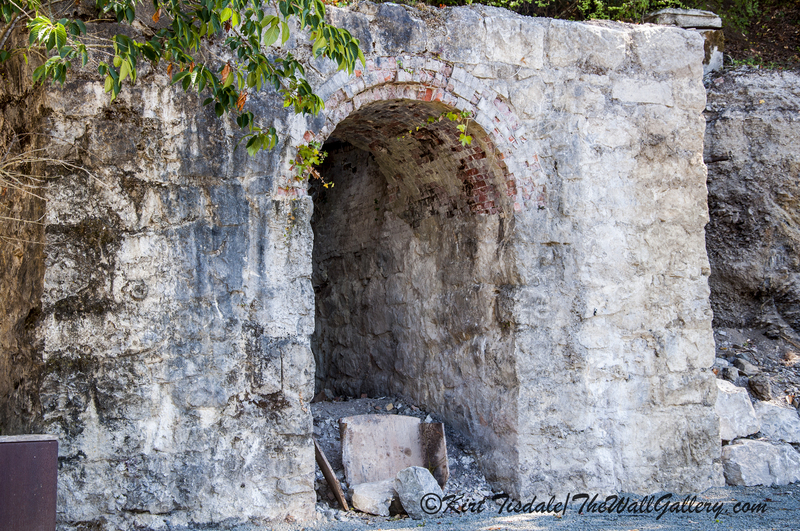 It sits next to the hill that housed the quarry and lines up with a row of kilns that were down on the harbor level. 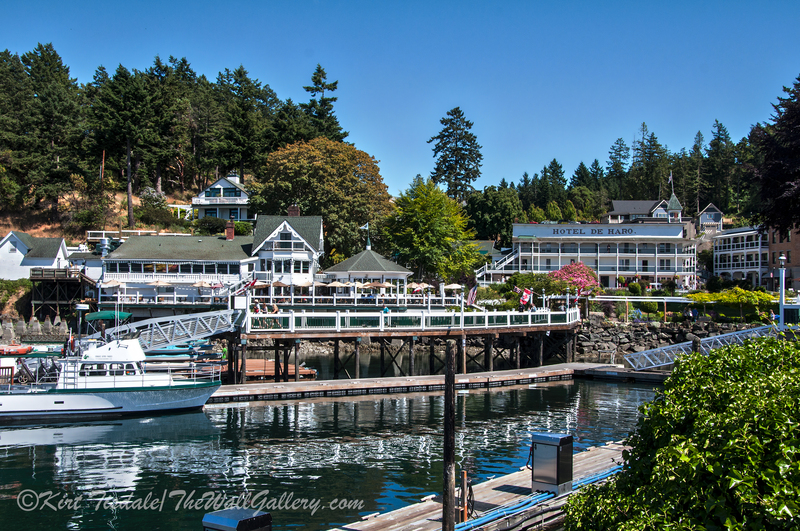 From this viewpoint, if you were to walk to your right, you would find yourself standing in front of Roche Harbor 4. 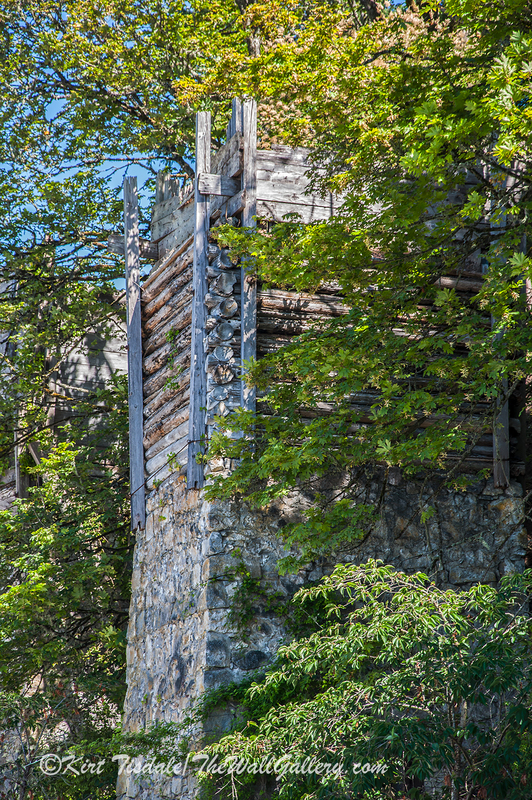 Roche Harbor 5 is a tower built from the local rock that has an old wooden platform on top for viewing out to the harbor and beyond towards Henry Island. Roche Harbor 6 shows one of the kilns. There is one long row of kiln after kiln lining the base of the hill. This is where the rock was burned, creating the lime that was known for its purity. Roche Harbor 7 takes us back into the village to the left and across the street from the Quarryman Hall. 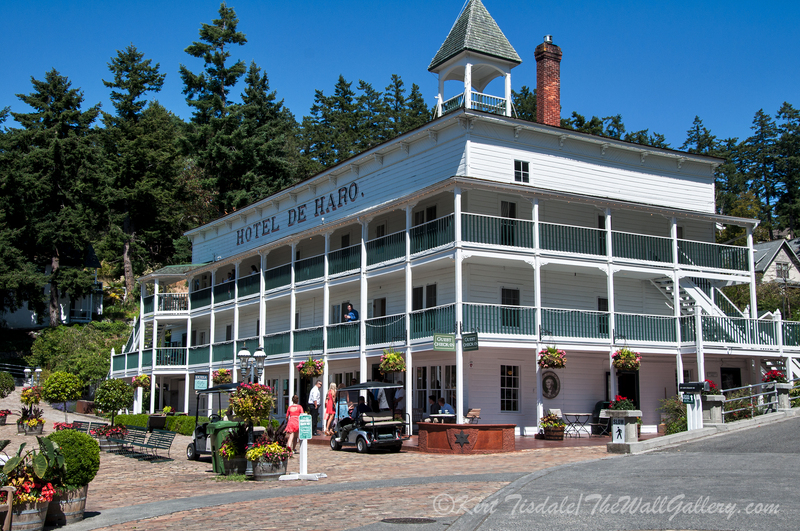 This is the Hotel de Haro and is the oldest continuous operating hotel in the state of Washington. The hotel is completely modern, but true to the original architecture. 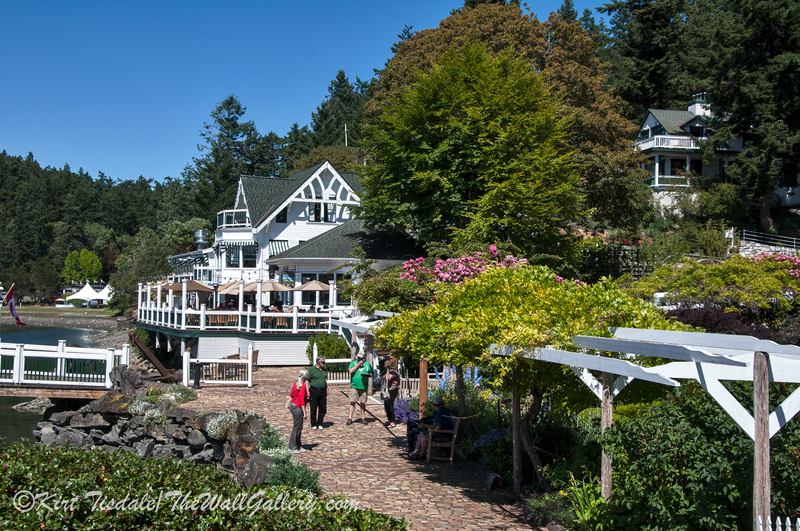 Roche Harbor 8 – I leave you with this shot of Roche Harbor as we head through this garden to get our boat to continue our journey over to Henry Island. Thoughts? 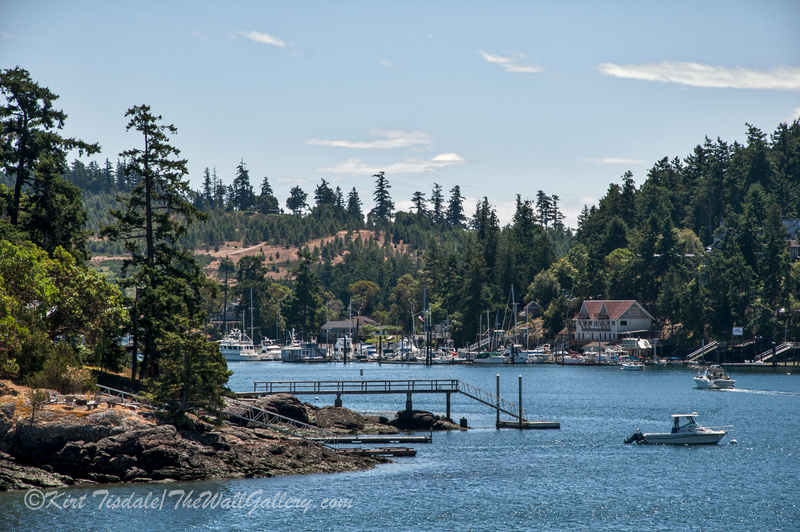 This entry was posted in Color Photography and tagged henry island, kirt tisdale, online art gallery, pacific northwest, photographer, photography, roche harbor, san juan island, san juan islands, Washington State on July 10, 2015 by Kirt D Tisdale. I have a penchant for black and white photography. I am drawn to it and have often wondered why. I finally realized what it was a few years ago. 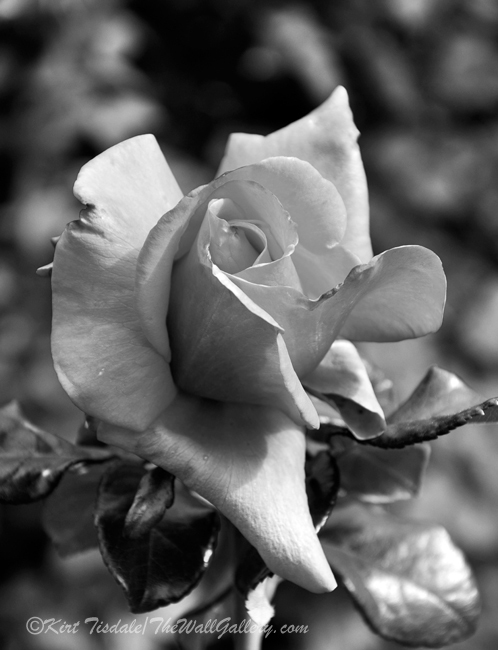 Good black and white photography highlights certain elements more than color photography. These elements are shapes, contrast, texture and lighting. We see these same things in a normal color shot, but in a black and white capture, they are highlighted because there isn’t any color to distract. Because of that, only certain captures work successfully in black and white. I’ve attached a series of six prints from my Black and White Photography 2 Gallery that highlight this aspect. The subject matter is floral blooms. 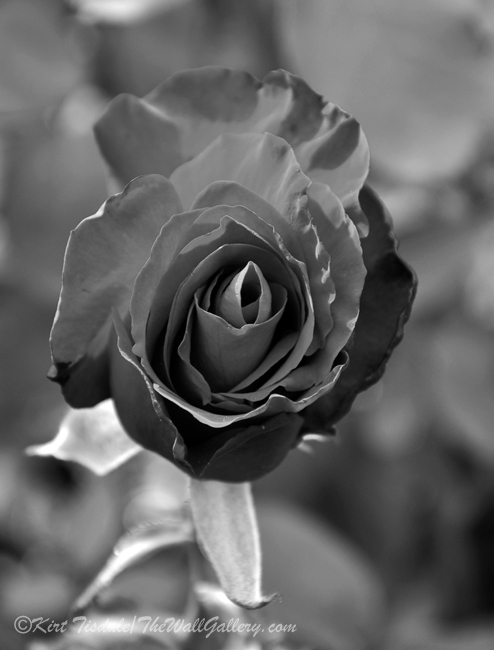 We are drawn to flowers initially by their color, but we appreciate the beauty of them via shapes and textures that take center stage in a B&W format. 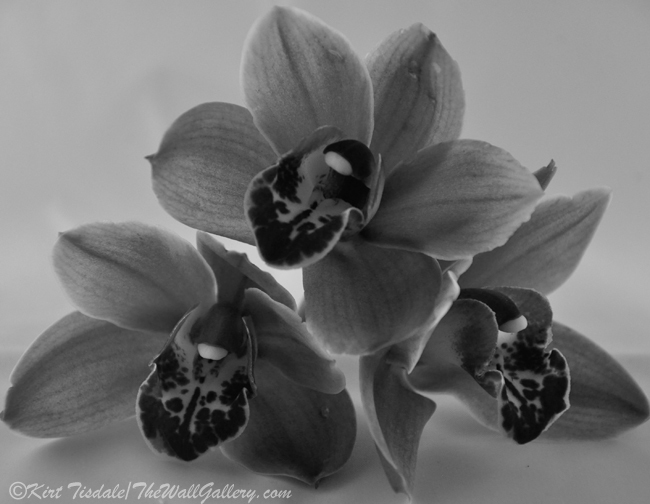 Following are six wall art prints that work very well as black and white photographs. The first one is called Camellia. With this particular capture, I used a filter that gives the print a grainy look, creating a vintage feel. Notice how the shape of each petal becomes a prominent factor. You also see subtle shading on each petal with a stronger lighting coming from the upper right (taken outdoors with sunlight). The second one I’ve titled Orchid Pyramid. It is almost a complete opposite in relationship to lighting. These blooms were taken using a shadow box, which diffuses the lighting creating a soft, subtle look. Again, the other elements take center stage such as the shapes of the petals and the contrast of the center of each bloom with the other petals. 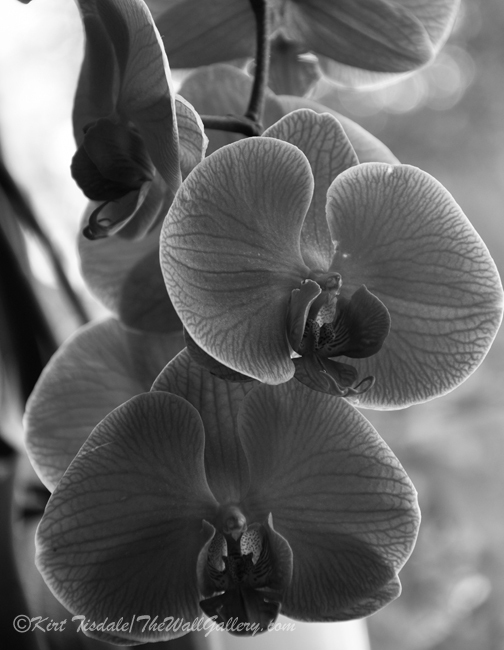 The third print is titled Orchid Blooms and is a series of blossoms on a stem using indirect lighting coming from a window. You see the strong light as it makes the middle bloom almost glow. Notice the delicate shapes and the intricate veins of each petal. Prints 4-6 take us into the world of roses. These particular shots come from a public garden in Portland, Oregon. The rose bushes were over 5 feet tall with huge blooms (very healthy, happy plants). The fourth print is called Rose Bud and highlights the strong lighting, which emphasizes the shapes of the petals in this rose bud. See the contrast in texture between the delicate petals and the leaves and branch? The fifth print I’ve titled Rose Blossom and it allows the viewer to really see how delicate the petals are and the intricacies of their shapes wrapped around each other. The lighting is a little more subdued, allowing the shapes to become center stage. The last one is titled Red Rose Bloom. It highlights the beauty and the delicate nature of the rose petals. 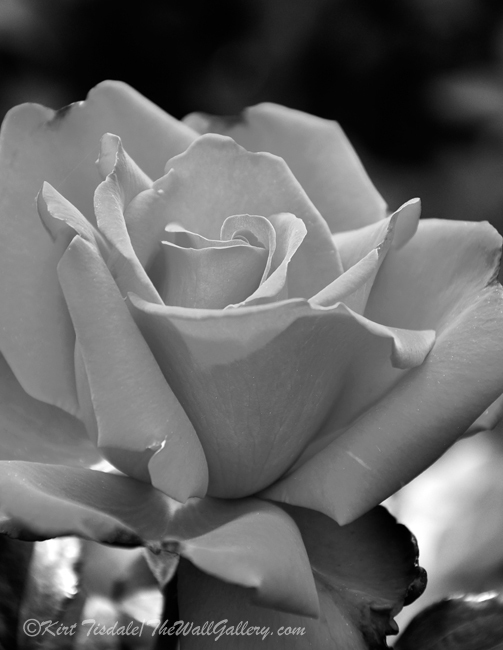 The shading you see in the B&W version allows your eye to really see the delicate simplistic nature of the many petals entwined together to form this bloom. Do you see the way the shapes, contrast, texture and lighting become much more relative to this type of photography? I also think the beauty of fine art black and white photography is that these prints, when framed and matted work in almost any type of room décor. Thoughts? I invite you to visit my Black and White Photography 2 Gallery to enjoy these prints and many more. 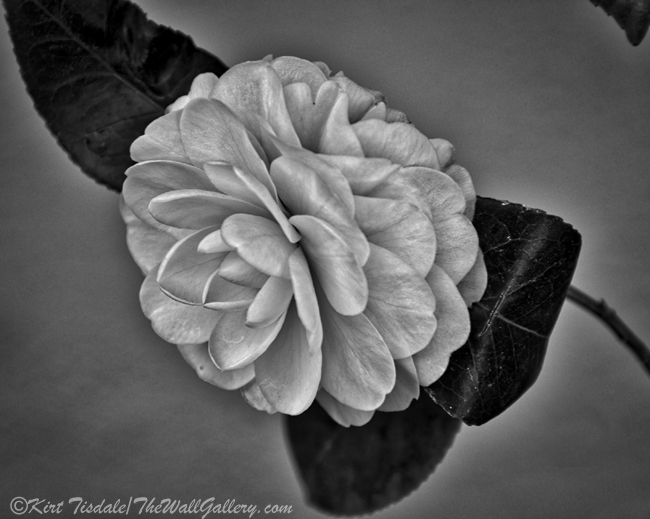 This entry was posted in Art Prints, Black and White Photography and tagged floral blooms, flowers, interior design, kirt tisdale, online art gallery, photographer, photography, rose blooms on July 6, 2015 by Kirt D Tisdale. We spent a long weekend in Seattle for Father’s Day and I wanted to share some shots from that trip besides my shaved head at a Sounders game from last weeks post. On Friday, we spent the day going up to Henry Island. 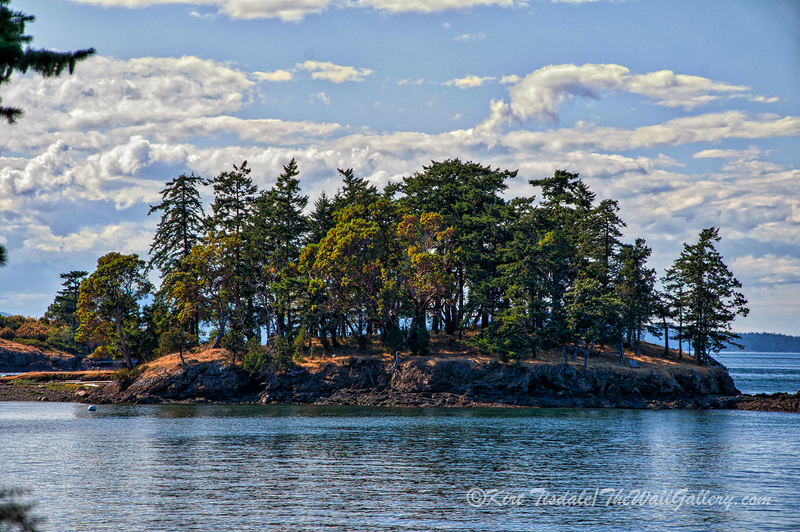 Henry Island is located on the north end of the Strait of Juan de Fuca in a group of islands called the San Juan Islands. This island is the most western island of the group and sits right across from Vancouver Island, British Columbia (just north of Victoria). 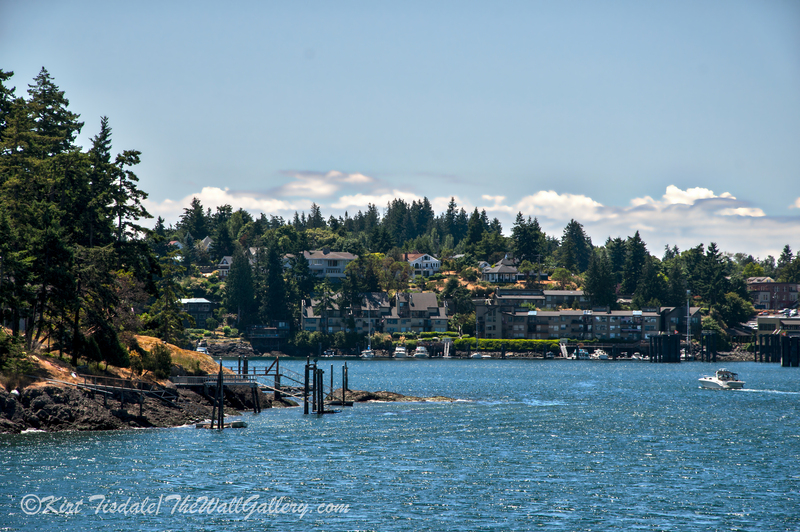 To get to Henry Island, we needed to take a ferry (car and pedestrian) from Anacortes, Washington to Friday Harbor, which is located on San Juan Island proper. 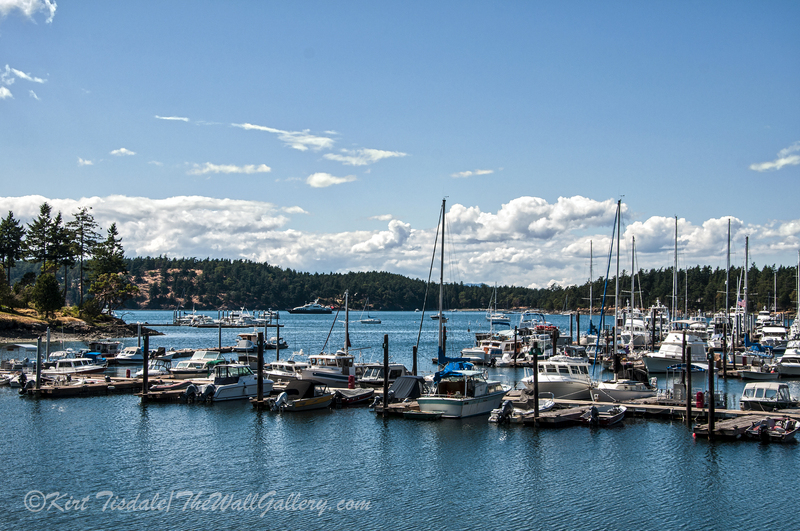 From Friday Harbor, we took our car across that island to the north end until we came into Roche Harbor. We did make a stop by Roche Harbor to go to an oyster farm, which is owned by the people we were going to see on Henry Island. After touring the oyster farm, we went back to Roche Harbor, parked the car and took a small boat that was left for us by family members over to Henry Island. I am going to be sharing a number of the shots that I took that day, but am breaking it down into what I think will be about three posts over the next few weeks. 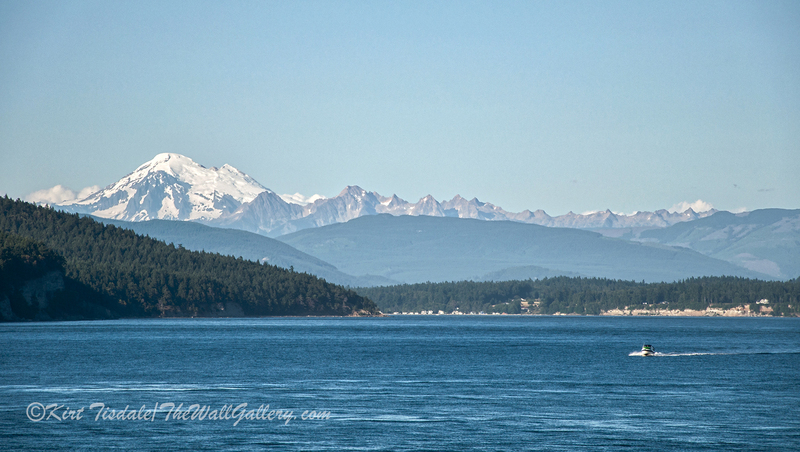 Today, I wanted to share some of the shots I captured on the ferry ride over to Friday Harbor. This capture is some of the smaller islands along the channel. The weather that day was picture perfect. It can get kind of rough traversing these channels when the weather is inclement. This is looking back towards the mainland (Anacortes). This capture is a sailboat passing by as we continue our “little over an hour” journey on the ferry. And we have arrived!! Again, the weather was picture perfect and I think was able to capture some great shots. Thoughts? 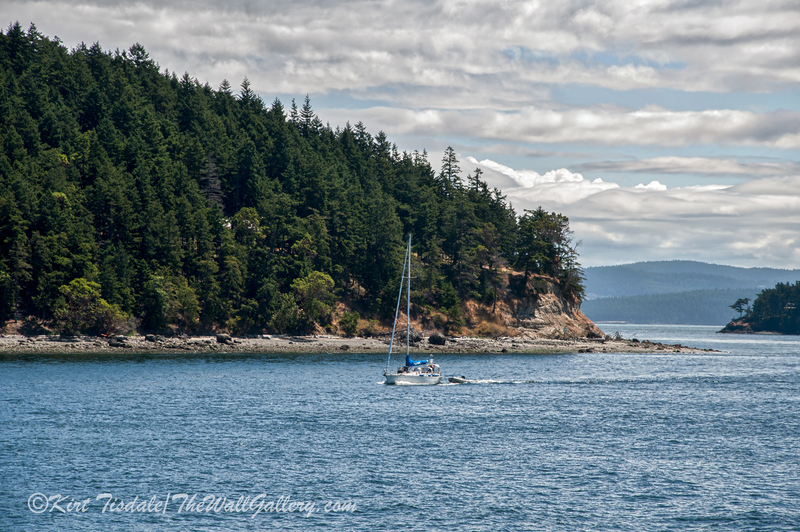 This entry was posted in Color Photography, Photography and tagged ferry, kirt tisdale, landscapes, online art gallery, pacific northwest, photographer, san juan islands, Washington State on July 1, 2015 by Kirt D Tisdale.